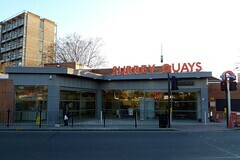 It has two entrances, one on Lower Road (pictured) opposite the entrance to Surrey Quays Shopping Centre, and the other on Rotherhithe Old Road. Last edited 2013-10-11 10:36:31 (version 13; diff). List all versions. Page last edited 2013-10-11 10:36:31 (version 13).